With Atlanta being the mecca of music, a new artist surfaces every 5 minutes. 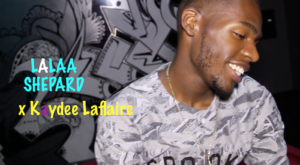 Hot Beats Studio is home to several popular artists in the city and Kaydee Laflaire is an emerging artist managed by one of the studios owners, Nina Blanka. Kaydee comes from a musical household and background as most of his family members served in the music business in some shape or fashion and he is ready to prove that he has the talent, dedication, and commitment to make it in this cutthroat industry. Hailing from Savannah, GA, Kaydee speaks on the importance of investing in himself, success of debut project, and personal life decisions that affect his music career.